"Where were you when John Lennon was shot?" "Where were you when you heard that President Kennedy was assassinated?" "Where were you when Elvis died?" I was too young to ever have a memory of those incidents and could never relate to the raw emotion those questions brought to the faces of those who could. 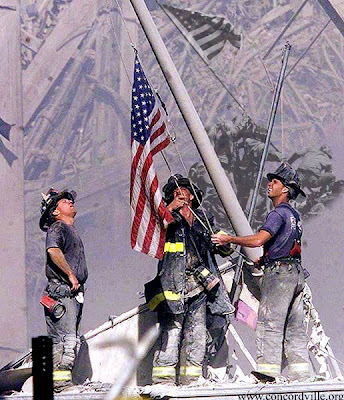 But on that day, September 11, 2001, my life was forever changed as it was for millions of Americans. Although my husband will tell you that I have the worst memory of anyone he knows, I can vividly recount the details of September 11, 2001. I was just a young mother with a 14 month-old son. Randy and I were watching Good Morning America when the first plane hit one of the Twin Towers. I walked out the door to take Little Man to daycare and go to work, when the media was just starting to pan their cameras over to Downtown Manhattan - wondering what had happened. By the time I dropped the baby off at daycare and had walked in the front door of my office, the whole place was abuzz. Another plane had hit the towers. This was no accident. 30-45 minutes later, I got a call from the Director of the daycare. "Come get your baby. We're closing down. No one knows what's going to happen." And that was the terror. No one knew what was going to happen. Would other cities be targeted? And if so, which ones? The whole country was paralyzed with fear and confusion. We all went home and stayed glued to the TV watching frightened reporters try to make sense of a situation that no one would ever be able to make sense of. I remember hearing a story of a daycare that was located across the street from the Twin Towers. When the planes hit and people were running for their lives, the daycare workers loaded up all of the babies and the children and walked - miles - over the Brooklyn Bridge to safety. As a mother sitting at home, clutching my own baby boy, I cried knowing exactly how those parents felt who had no idea where their children were or what had happened to them. And could imagine the joy in their hearts when they realized that, thanks to the quick thinking of others, their babies were safe. "Let's roll." Those two words were made legendary by Todd Beamer who, on the morning of September 11, 2001, was just a husband and a father who boarded United Flight 33 on his way home from a business trip. After United 93 was hijacked, Beamer and other passengers communicated with people on the ground via in-plane and cell phones. Beamer reported that one passenger was killed and, later, that a flight attendant had told him the pilot and co-pilot had been forced from the cockpit and may have been wounded. He was also on the phone when the plane made its turn in a southeasterly direction, a move that had him briefly panicking. Later, he told the operator that some of the plane's passengers were planning to "jump on" the hijackers. According to Jefferson, Beamer's last audible words were "Are you guys ready? Let's roll." The enduring spirit of the human race is that when bad things happen, people pull together, forget their differences and say, "Let's fix it and make it better. Let's roll." That's what makes America great. We keep rolling. Take a moment to remember and be grateful that we live in the best country in the world!